MIB tagged 1955 Ginger Coat outfit #940. The outfit comes from the "Four-Season Coat Series" and consists of a crisp purple-blue nylon coat with lace detail on the collar and sleeves and two white buttons on the front. The coat does show color fading/sheen on the back where it has been stored flat in the box (see photo). The beautiful matching horsehair bonnet has a pretty sprig of flowers and ties with a dark blue velvet ribbon. 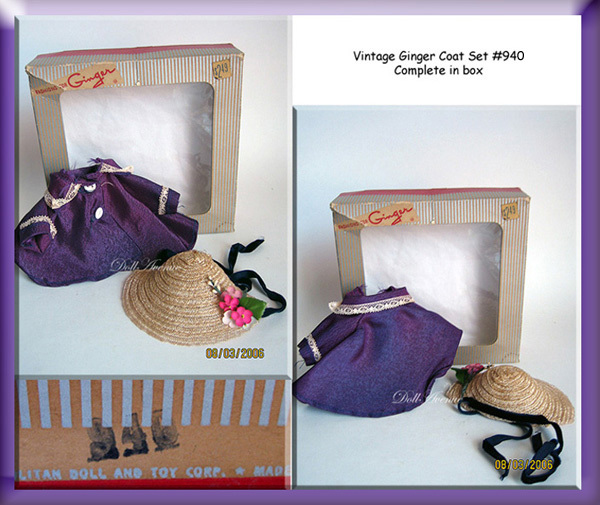 Included is the correct Ginger outfit box marked 940 in excellent condition (cellophane intact), with the original price tag of $2.49. Comes from smoke-free environement.